Causes: You want to encrypt the phone field in Active Directory so you switch the encryption in the webconfig to a numerical value. 0 is no encryption, 1 is standard encryption, 2 is advanced encryption. Description: Changing this value will not encrypt the value in AD because the default phone field in AD cannot accommodate the encrypted value. Resolution: You must tie an attribute to the phone 1 or phone 2 field that is large enough to accommodate an encrypted value. It must be a directory string with at least 550 spaces. 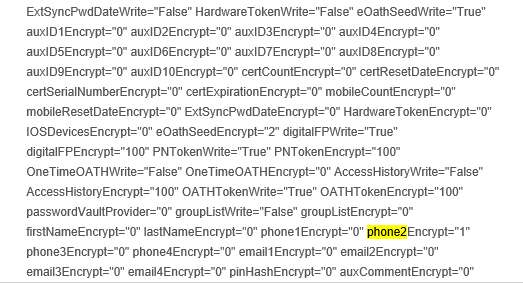 For the sake of this test, I used the attribute "Description" for my phone field.